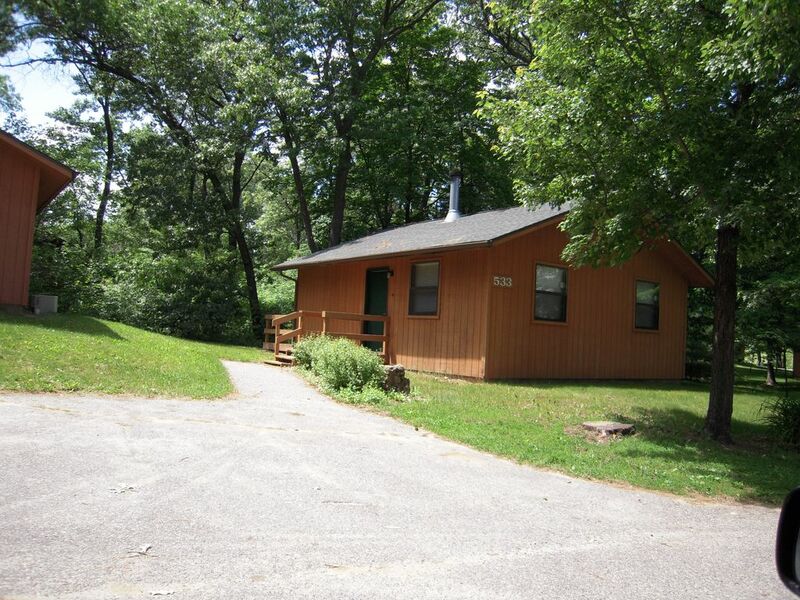 Offering some of Wisconsin Dells most quaint accommodations, The cottage is set in the woods in this expansive resort, this gives vacationers their own private spot in the woods. 650 square feet fully accommodated with fireplace, ceiling fan, central air, television and vcr player, dishwasher, stove, refrigerator, microwave, toaster, coffee maker, phone, and a open air deck with chairs. This vacation home sleeps six; one king size bed, (1 Queen OR two twins) and a sleeper sofa. One level vacation home set along golf course and outdoor pool. Approximately 900 square feet fully accommodated with gas fireplace, screened in deck with Jen-aire grill and patio furniture, whirlpool tub, central air, television and DVD player, dishwasher, stove, refrigerator, microwave, toaster, coffee maker, blender, phone and washer/dryer. This vacation home sleeps six; one queen bed, two twins and a sleep sofa. The resort charges a $80 housekeeping fee per stay, payable to the resort. Very impressed with all of the facilities. Great experience! The staff was always willing to help at any time. Our only issue was Mother Nature! We just needed a little more snow! It seemed like a very nice family spot. I loved that it wasn't right in the Dells but close. So glad you enjoyed your time. Hope you can come back again and enjoy all the amenities at the resort. My whole experience from booking to checking out was great. The pictures represent the cabin accurately and it was clean and modern. Beds were super comfortable. We loved the kitchen because we were able to cook some of our own meals. When we didn't feel like cooking we could just grab something from the restaurant on-site or drive a few minutes into town to find something. The kids loved the indoor waterpark! We would definitely return. So glad you had a great trip and the unit meet your expectations. I too love the option to cook or not! Stay @ The Timbers was a perfect "10"
My wife and I have been going to the Dells area for for at least 30 years now. We had been renting from a another all that time, but we had noticed the location and the condo was not as well taken care of and not so clean. Our family had a terrific time at Christmas Mountain Village! This was an affordable vacation, staff were friendly and the weather was great. We spent a lot of time at the pools. We also enjoyed golfing, mini golfing, singing karaoke and canoeing. The cottage had everything that we needed. We enjoyed meeting people at the grilling areas which were a short walk away from where we stayed. There were many activities for the kids to keep them busy. They only participated in a few because the weather was so wonderful! We enjoyed a trip to House on the Rock on a cloudy day. We cooled off at Noah's Ark on an 85 degree day which was about 5-10 minutes away. We look forward to visiting again. Sherri was very friendly, professional and helpful. We plan to contact her in the future about other vacations she offers. Thanks for the great vacation Sherri! Thank you, glad you had a great time. The Dells has so much to offer. It was fun!! !We had a great vacation without spending a fortune. The resort has all the amenities to keep the whole family entertained. The cottage was clean and big enough to accommodate 6 of us comfortably. We can't wait to go again. Many dates & unit types available. Please see our website or feel free to call. We often have last minute rentals Free wifi. The resort will authorize your credit card for the security deposit. There is no daily housekeeping. You may pick up clean towels everyday at the designated area. But they are not delivered to your unit.